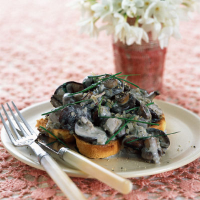 Combine your favourite mushrooms and serve in a light and creamy garlic and herb sauce on toasted brioche for this delicious starter. Clean the mushrooms with a small brush or wipe over with damp kitchen paper. Heat half the butter and oil in a large lidded frying pan, then add the shallots and cook over a low heat for 5 minutes until slightly softened, but not coloured. Add the remaining butter and oil plus the mushrooms. Season with a little freshly ground black pepper, cover and cook for 8-10 minutes, stirring occasionally, until the mushrooms are soft and just cooked. Remove the lid and stir in the Marsala and tarragon and cook for 2-3 minutes until the liquid is syrupy. Stir in the crème fraîche and simmer for a further 1-2 minutes until slightly thickened. Meanwhile, preheat the grill to a medium heat. Lightly toast the brioche then divide between 6 serving plates and spoon the mushroom mixture over the tops. Serve immediately, garnished with the snipped chives. The mushrooms can be cooked a day in advance up to the end of Step 2. Allow to cool. Reheat and finish the recipe, when ready to eat. This dish works well with a lightly chilled off-dry, nutty sherry, such as Waitrose Solera Jerezana Dry Amontillado Sherry.